All registered teachers must undertake 60 hours of professional learning during each 3-year term of registration. You can find out your term of registration dates on the Teachers Portal. This is a minimum requirement that applies regardless of your employment status (e.g. full-time, part-time, temporary relief teacher, extended leave including parenting leave, retired). The requirement to undertake and record 60 hours of professional learning is the personal and professional responsibility of all registered teachers in order to maintain their registration. Professional learning ensures all teachers continually update their knowledge and practice and are classroom-ready at any time. It is recommended that teachers undertake and record their professional learning over the course of their 3-year term of registration, and not wait until the renewal period towards the end of the registration term. Registered teachers who have not completed a minimum 60 hours of professional learning may not be permitted to renew their registration. Teachers who have exceptional and/or extenuating circumstances must apply to the Board for special consideration. assists them in supporting the learning of children and students, now or in the future. recorded, and with supporting evidence retained, to verify that the learning has occurred. How do I know if an activity is professional learning? Did the activity have a focus on learning for me as a teacher, which furthers my ability to support the children/students I teach (now or in the future)? Think about how the learning would fit within your context e.g. the age group you teach, your content areas/specialisations, the needs of your learners, your development needs, school/site priorities, etc. You will not be able to count time spent facilitating learning for others e.g. delivering a workshop, mentoring a pre-service teacher, etc. as this is not learning for you (except any time spent doing your own training/research etc. in preparation for this). Was the activity over and above the day-to-day role and responsibilities of a teacher? Completing tasks such as planning, using a curriculum, programming, preparation of learning resources, assisting learners with their work, assessment and reporting (and so on) are part of a teacher’s role and are not professional learning activities. Just because an activity occurs outside of teaching hours does not automatically mean it is professional learning e.g. parent-teacher interviews, camps, supervising extra-curricular activities etc. are all part of a teacher’s day-to-day role. You can count professional learning that you have undertaken at work or which your employer requires you to do e.g. first aid training or PD components of staff meetings. Could I make a connection between this activity and at least one of the Australian Professional Standards for Teachers? 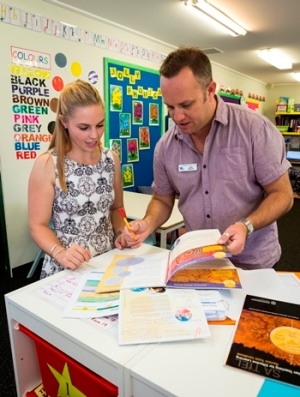 You need to be able to draw a link between each learning activity you record and one or more of the Australian Professional Standards for Teachers. You will also need to briefly describe, in your own words, how you have made this connection.